While it's true that Siri on the Mac can control a few basic Mac functions, such as adjusting volume or changing the display's brightness, the truth is you don't need Siri to perform these tasks. You probably weren't aware of it, but you've been able to use your voice to control your Mac for a long time. Instead of relying on Siri for controlling very basic Mac system options, try using Dictation and voice commands; they give you a great deal more flexibility, and they work with both current and older versions of the Mac OS. The Mac has had the ability to take dictation, and convert a spoken word into text, since the feature was introduced with OS X Mountain Lion. The original Mountain Lion version of Dictation had a few drawbacks, including the need to send a recording of your dictation to Apple servers, where the actual conversion to text was performed. This not only slowed things down, but also had some people a bit concerned about privacy issues. With OS X Mavericks, Dictation could be performed directly on your Mac, with no need to send information to the cloud. This provided a performance improvement, and eliminated the security concern about sending data to the cloud. Although the Mac has supported voice input since the days of the Quadra models and Mac OS 9, this guide specifically uses the dictation features that are available on Macs running OS X Mountain Lion and later, including the newer macOS. A microphone: Many Mac models come with built-in mics that will work fine for voice control. If your Mac doesn't have a mic, consider using one of the many available headset-microphone combos that can connect via USB or Bluetooth. The Mac's dictation system isn't limited to speech to text; it can also convert speech to voice commands, letting you control your Mac with just your spoken words. The Mac comes equipped with a number of commands ready for you to use. Once you set the system up, you can use your voice to launch applications, save documents, or search Spotlight, for just a few examples. There's also a large set of commands for navigation, editing, and formatting text. You're not limited to the commands that Apple included with the Mac OS; you can add your own custom commands that let you open files, open apps, run workflow, paste text, paste data, and cause any keyboard shortcut to be executed. If you would like to become a Mac Dictator, follow these steps to set up Mac dictation and create a custom voice command that will check for new mail. Select either the Dictation & Speech preference pane (OS X El Capitan and earlier), or the Keyboard preference pane (macOS Sierra and later). Select the Dictation tab in the preference pane you opened. Use the Dictation radio button to select On. A sheet will appear, with a warning that using Dictation without enabling the Enhanced Dictation option causes a recording of what you say to be sent to Apple for conversion to text. We don't want to be encumbered by a wait for Apple servers to convert speech to text, and we don’t like the idea of Apple listening in. Therefore, we're going to use the Enhanced Dictation option, but to turn the enhanced options on, we have to first finish enabling basic dictation. Click the Enable Dictation button. Place a checkmark in the Use Enhanced Dictation checkbox. This will cause the Enhanced Dictation files to be downloaded and installed on your Mac; this may take a few minutes. Once the files are installed (you'll see status messages in the bottom left corner of the preference pane), you're ready to continue. Now that Dictation is enabled, and the Enhanced Dictation files are installed, we're ready to create our first custom voice command. We're going to have the Mac check for new mail whenever we utter the phrase, "Computer, Check Mail." Open System Preferences, if you closed it, or click the Show All button in the toolbar. Select the Accessibility preference pane. In the left-hand pane, scroll down and select the Dictation item. Place a checkmark in the 'Enable dictation keyword phrase' box. In the text field, just below the box, enter a word you would like to use to alert your Mac that a voice command is about to be spoken. This can be as simple as the suggested default "Computer" or perhaps the name you gave your Mac. You'll notice a list of commands that are already understood by your Mac. Each command includes a checkbox to allow you to enable or disable the spoken command. Since there's no check mail command, we'll have to create it ourselves. Place a checkmark in the 'Enable advanced commands' box. Click the plus (+) button to add the new command. In the 'When I say' field, enter the command name. This will also be the phrase you speak to invoke the command. For this example, enter Check Mail. Use the While Using dropdown menu to select Mail. Use the Perform dropdown menu to select Press Keyboard Shortcut. That’s the shift key, the command key (on Apple keyboards, it looks like a cloverleaf), and the n key, all pressed at the same time. 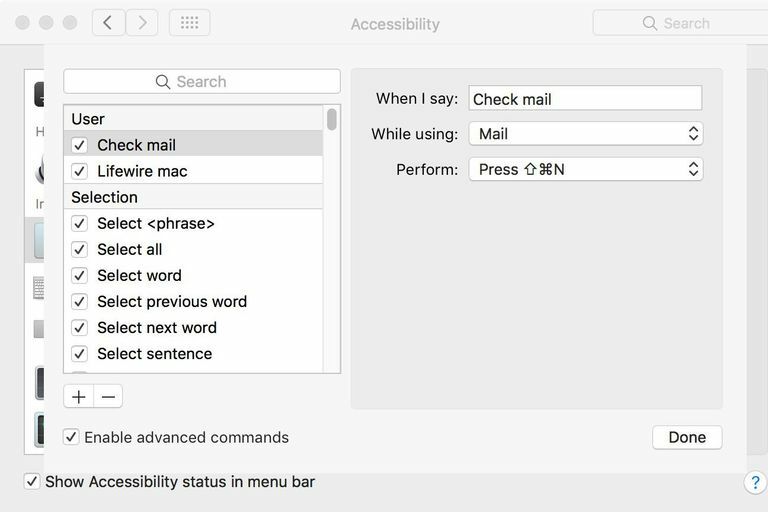 Once you say the command, your Mac will launch the Mail app, if it isn't already open, bring the Mail window to the front, and then execute the Check Mail keyboard shortcut. The Check Mail voice command is just an example of what you can do with the Mac's dictation options. You're not limited to apps with keyboard shortcuts; you can use Automator to build simple or complex workflows that can be triggered with a voice command.